The Lady is touching the unicorn on its magical healing horn in this work originally rediscovered in 1841, the Touch, from the series of unicorn tapestries. The background is based on red, and is dotted by flowers and animals in a distinctive style known as thousand flower. 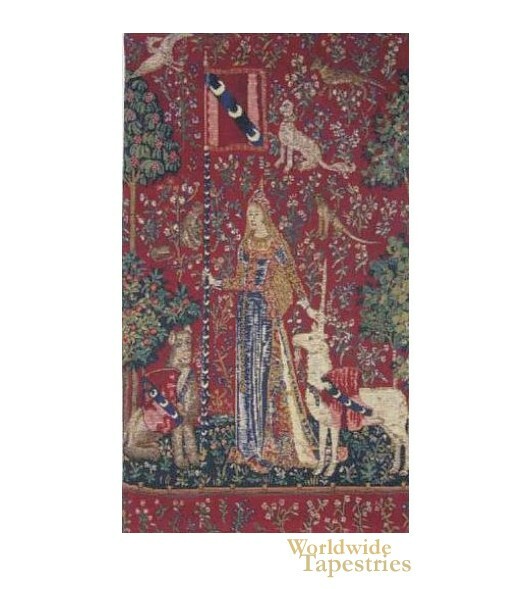 This unicorn art tapestry "Touch (Lady and Unicorn) II" is backed with lining and tunnel for easy hanging. Dimensions: W 16" x H 27"